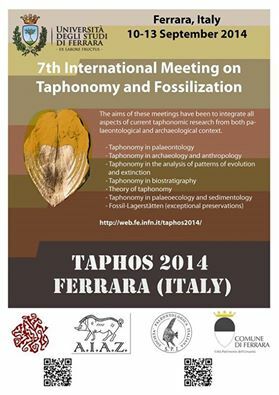 Il 7th Meeting on Taphonomy and Fossilization, tenutosi a Ferrara dal 10 al 13 settembre 2014, ha visto la partecipazione del CRS “Enzo dei Medici” con un contributo dal titolo “Taphonomy and post-depositional movements of a Bronze Age mass grave in the archaeological site of Grotta della Monaca (Calabria)”, a cura di F. Arena ed E. Gualdi Russo. Grotta della Monaca site is located in the SantʼAgata di Esaro place (Cosenza), in the north of Calabria region. This cave presents plentiful iron oxides and copper carbonates, which have been intensively extracted since very ancient times (about 6000 BP). The archaeological importance of this site is confirmed by the presence of an extended underground graveyard dated to the Middle Bronze Age (3500 BP). The skeletons have been inhumed in the most underground chambers of the cave, into niches and cracks of the walls. A mass grave (called “m5v”) containing 24 individuals has been recently discovered in one of these niches. The skeletons have not been found in anatomic connection. They were in bad state of preservation for many taphonomic events: the passage of men during post-medieval times, the action of animals, the humidity of the cave that crumbled the human skeletal remains. During archaeological excavating it was not possible to identify any complete skeletons because they were dismembered and disorderly clamped. This work would present the state of preservation of human bones found in an underground archaeological context and the analysis of specific taphonomic traces: animalʼs traces of gnawing (furrows and scores), traces of animalʼs passage (trampling marks), wathering cracks (Fig. 1a-d). The anthropological analysis permitted to reconstruct each skeleton using the mass graves methods of reconstruction and provided information about taphonomic processes and movements involving the bones after tissues decomposition. Concluding: (a) the sample of Grotta della Monaca was in bad state of preservation because of the repeated passage of men during different periods; (b) the action of animals in the cave and the humidity left evident taphonomic marks on the bones; (c) in m5v mass burial there were 24 individuals that have been inhumed in different times of the Middle Bronze Age. The ossicles of these skeletons slipped to the lower levels of archaeological deposit because the grave had not been filled with soil by Bronze Age people. The skeletons have been found superimposed and their position followed natural inclination of the burial place.